Osmosis: Cor pulmonale. (2019, April 20). Retrieved from (https://www.osmosis.org/learn/Cor_pulmonale). 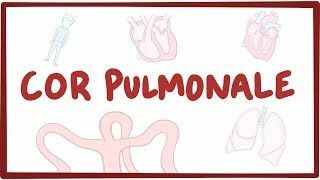 Pulmonary heart disease, also known as cor pulmonale is the enlargement and failure of the right ventricle of the heart as a response to increased vascular resistance (such as from pulmonic stenosis) or high blood pressure in the lungs. Cor pulmonale is a cardiac disorder that can manifest in due to chronic, hypoxic pulmonary vasoconstriction. A 52-year-old Caucasian man comes to the office due to 3 days of progressive dyspnea and purulent sputum production. The patient takes albuterol and tiotropium bromide for moderate chronic obstructive pulmonary disease. His medical history is relevant for a 40 pack-year smoking history, type II diabetes mellitus, hyperlipidemia, and coronary artery stenting 2 years ago. Physical exam shows barrel shaped chest, inspiratory crackles, hepatojugular reflux, pulsus paradoxus, and ventricular gallop. His temperature is 38.1°C (100.5°F), the pulse is 130/min, respirations are 28/min, blood pressure is 130/84 mmHg, and pulse oximetry on room air shows an oxygen saturation of 86%. This patient most likely has which of the following conditions?